← Epic Rap Battle Video! Al Capone Versus…? It’s Got Spirit: “American Spirits,” a Prohibition Exhibit at the MOHAI…and may soon be at a museum near YOU! A few days ago I was in Seattle visiting a friend when a poster caught my eye. It was for a museum exhibit at the MOHAI, Seattle’s very own Museum of History and Industry, called American Spirits: the Rise and Fall of Prohibition. Banner taken from the Minnesota exhibit run. Running from April 2nd through August 23rd, American Spirits is a traveling exhibit which originated at the National Constitution Center in Philadelphia. Its curator is none other than Daniel Okrent, the same man who wrote Last Call: the Rise and Fall of Prohibition. A fine summary of the political machinations behind the acceptance and eventual overthrow of the Volstead Act, Last Call was also the basis for Ken Burns’ three part PBS documentary Prohibition. Okrent’s exhibit follows along much the same lines, hitting the highlights of the era—the music, the booze, the changing social mores, and so on—while grounding them in the complicated political situation that allowed the Volstead Act to pass in the first place. Explaining these strange political relationships is a major strength of American Spirits. Fun interactives like the “Wet or Dry?” quiz show how people with very different concerns—from religious issues to women’s rights—ended up on either side of the wet or dry divide. Personally, thanks to my stance on women’s rights, I ended up on the dry side—but if I’d been a recent immigrant, or a different kind of religion, I might’ve ended up a wet. 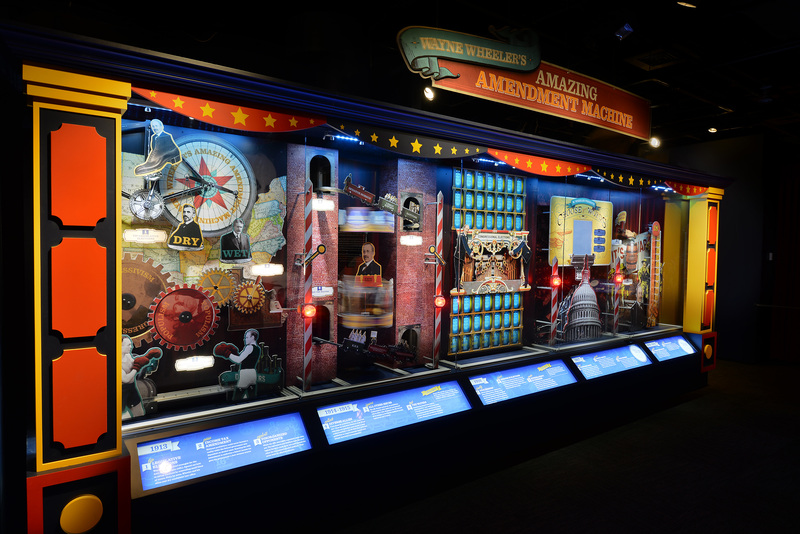 Another exhibit highlight in a similar vein is the “Wayne Wheeler’s Amazing Political Machine,” a 20-foot-long colorful contraption that’s reminiscent of early 1900s circus automatons. Full of moving cut-outs and blinking lights, it neatly describes the way Wayne Wheeler managed to tip the balance of Congress in favor of tacking the 18th Amendment onto the US Constitution. 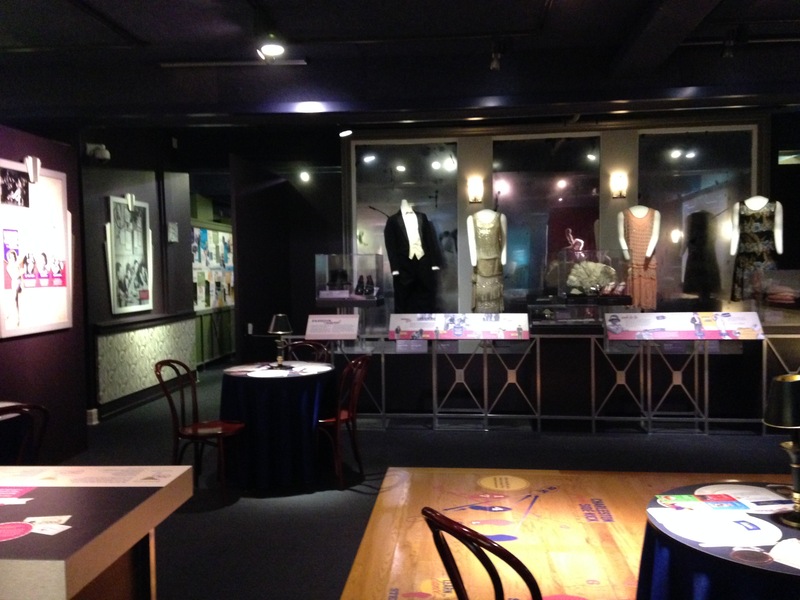 The speakeasy room of the American Spirits exhibit, taken on my phone—sorry for the blurriness. Check out the cool period clothes in the back! Other fun exhibit interiors included a fake church interior with pews for the Temperance movement (full of fun reprints of anti-alcohol posters and recordings of Temperance songs), a fake line-up where you could take photos next to cut-outs of notorious gangsters (naturally, I opted for a shot with Al ;)), and fun interactives like a video game where you act as the Coast Guard to stop rumrunners from getting to shore. Everywhere you went, there was a playful air to the way the material was presented that encouraged you to keep going. The downside to all this glitter, however, is that there was often little depth to the information and the objects they featured. Naturally, I was particularly disappointed on the lack of information about the connection between Prohibition and the rise of organized crime throughout the country, though to their credit they had a fair amount of information about Roy Olmstead, Seattle’s most famous bootlegger. Perhaps that was something they adjusted as the exhibit moved from city to city. Either way, I really enjoyed the fake line-up where you could take pictures, cheezy though it was :). The exhibit’s label copy also tried to link back to the US Constitution throughout the exhibit, which got a bit annoying at times, at least to me—until I found out it was created by the National Constitution Center, anyway. Overall, I’d say American Spirits is a fun, playful and engaging introduction to the Roaring Twenties—while still managing to explore what happens when a government tries to police people’s moral and ethical choices in a wholesale manner. If you have any interest in the era at all, I’d say it’s worth seeing. Looking for more information on American Spirits? Try these links below. The MOHAI’s page for this exhibit not only has ticket purchasing and exhibit information, but features a 1920s Seattle photo gallery and a fun interactive map with former Seattle speakeasy locations marked on it. 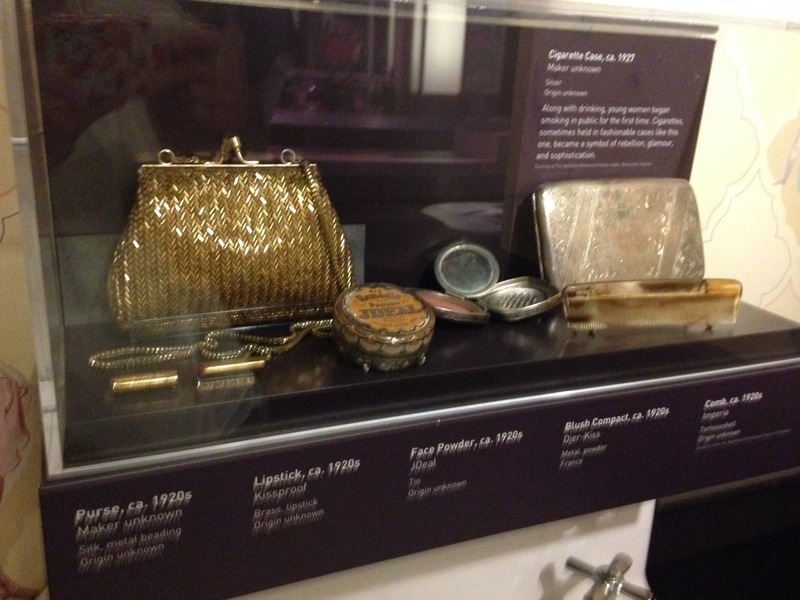 The museum is also hosting a number of tied in events relating to the 1920s, such as guest lectures on 1920s fashion. The National Constitution Center still has a homepage for this exhibit. It contains a wealth of extra information about the 1920s and the exhibit itself, as well as educator resources and multimedia. Looking for a second opinion? Try this 2012 New York Times review, or this one from The Morning Call. 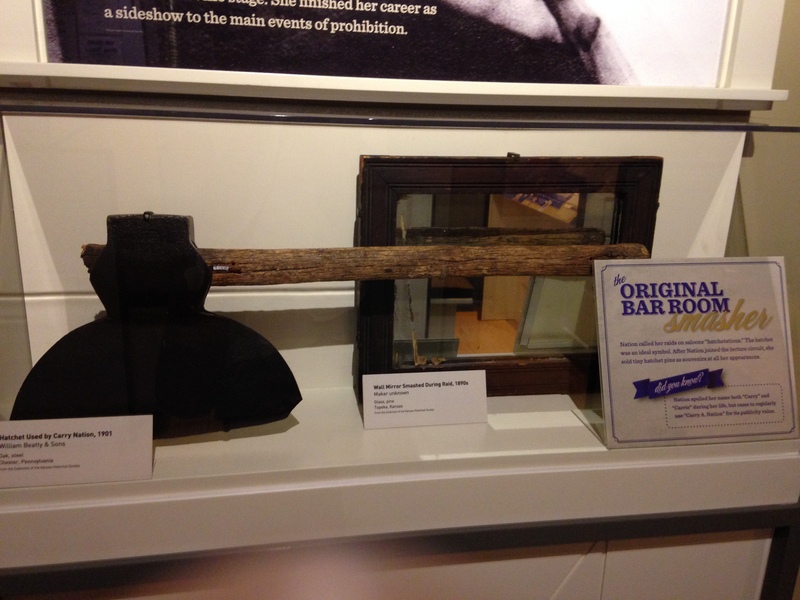 This entry was posted in museum exhibit review and tagged American Spirits: The Rise and Fall of Prohibition museum exhibit, MOHAI Seattle exhibits summer 2015, museum exhibit review, Prohibition museum exhibit. Bookmark the permalink. 1 Response to It’s Got Spirit: “American Spirits,” a Prohibition Exhibit at the MOHAI…and may soon be at a museum near YOU!